The ADR Perspectives newsletter is one of two official publications of the ADR Institute of Canada Inc./ Institut d’Arbitrage et de Médiation du Canada Inc.
With a cross-Canada Editorial Board of some of the foremost mediators and arbitrators in the country, the ADR Perspectives newsletter is intended to be useful and relevant to ADR end users, by publishing short articles with a practical focus containing suggestions and general advice on arbitration, mediation, and other ADR topics. The inaugural issue was published in electronic format in March 2014, with a total of four issues to be published annually. SUBSCRIBE There is no charge to subscribe to this publication. 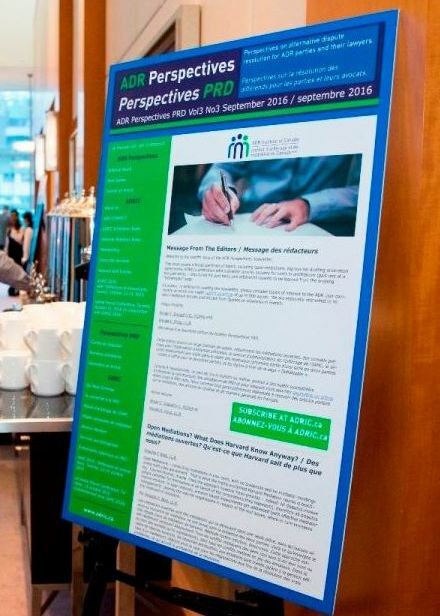 Advertising in ADR Perspectives is an excellent way to deliver your message to over 2,500 members and users of ADR services across the country. Playing by the Rules of the Game: Arbitration in a Professionnal Sports Context << Jouer selon les règles : l’arbitrage dans le milieu du sport professionnel >>Randall W. Block, Q.C., Justine Blanchet, Hon. Thomas Cromwell, C.C. Securing the Advantages of Arbitration, Hon. Clifton D. O’Brien, Q.C. Open Mediations? What Does Harvard Know Anyway? Douglas F. Best, LL.B. Top Five Tips for Drafting Arbitration Agreements, Mary E. Comeau, LL.B. Bargainer’s Remorse: Collective Bargaining Agreement Highlights Limited Ability to Appeal Arbitral Awards in Deflategate Appeal, Norm Emblem, LL.B. and Barbara Capes, J.D. Security for Costs in Arbitration: Part One, Gordon L. Tarnowsky, Q.C. and Rachel A. Howie, LL.M. Arbitrator Disclosure, Earl A. Cherniak, Q.C. Building Better Arbitrations: Proactive Considerations to Achieve Business Objectives, Mark Gerlitz, J.D., M.B.A.
ADR – One Size Does Not Fit All Gavin Giles, Q.C. When Do Foreign Arbitral Awards Become Ripe For Enforcement In Canada? “Time is Money” Jack Marshall, Q.C.